Citrine is a yellow or golden variety of quartz, colored with iron. Natural citrine is relatively rare, occurring in Brazil, Madagascar and Myanmar. Most citrine on the market today is actually heat-treated amethyst. When amethyst is heated to abut 900 degrees Fahrenheit, it alters to a golden tone. This treatment is completely stable, and it has no negative influence on the assessment of the gem. 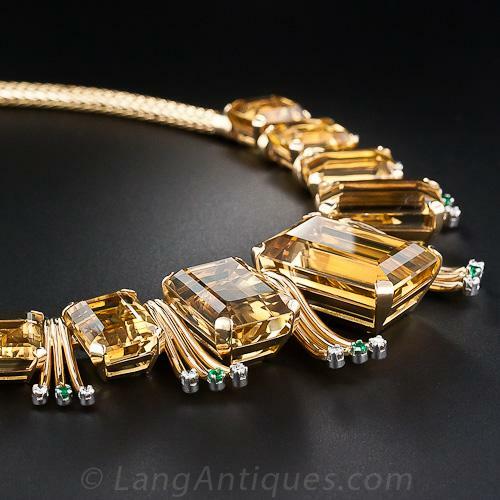 Intensely colored citrine is sometimes misrepresented as the more valuable yellow topaz. Madeira topaz and Bahia topaz are actually misnomers because they both refer to citrine, not topaz. The irony is, that although topaz is considerably more expensive than citrine, citrine is tougher and wears better than topaz. Citrine is a gemstone which has been used in Greece since the Hellenistic period (end of the 4th to the end of the 1st century BC). Citrine is the birthstone for the month of November as adopted by the American National Association of Jewelers in 1912. Citrine is also the Planetary gem for the Astrological Sun Sign of Virgo and the accepted gemstone for the Thirteenth and Seventeenth wedding anniversary. Citrine has been credited with aiding in the cure of jaundice, urinary tract infections, and kidney ailments. It is believed to aid the heart, kidneys, liver and muscles. The chakra based interpretation views citrine as uplifting, bright, energizing and inspirational. It encourages the free flow of Chi and activates and inspires intuition. It promotes creativity while eliminating self-destructive behavior. Similar Stones: Citrine can be confused with topaz, glass, yellow sapphire, heliodor, garnet varieties (such as hessonite, spessartite and grossular) and amber.